“My actions are my only true belongings: I cannot escape their consequences. My actions are the ground on which I stand,” which is often attributed to the Buddha, is actually by Thich Nhat Hann. It’s from his book “The Heart of the Buddha’s Teaching,” page 124. Neither is a “real” quote, the Buddha did not speak English. This is calling a “tighter” translation “real” and a “looser” translation “fake”. In my experience, due to cultural and linguistic differences, a paraphrase can sometimes more accurately convey the meaning of a text than a “tight”, word-for-word translation. The Buddha didn’t speak Pali either, incidentally. There are no “real” Buddha quotes — just quotes that are found in the scriptures. Anyway, you’re correct in highlighting that there’s a gray area. This is something I struggle with, and it’s why I have a category on the site called “fakeish.” But in this case we’re clearly dealing with a loose paraphrase rather than even a liberal translation, and I don’t have much hesitation in saying that this one is fake — or not a genuine translation from the scriptures. 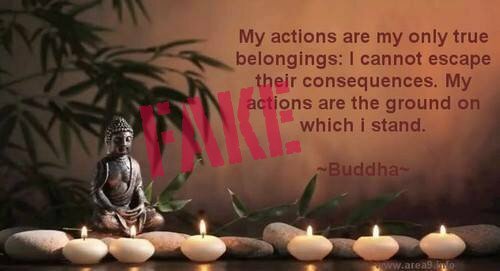 It is not proper, Upasaka Bodhipaksa to call it fake, since the meaning is well conform with the Buddhas teaching and it stand with the Dhamma. Kammassakomhi kamma-dāyādo kamma-yoni kamma-bandhu kamma-paṭisaraṇo. I am the owner of my actions, heir to my actions, born of my actions, related through my actions, and live dependent on my actions. Yaṃ kammaṃ karissāmi kalyāṇaṃ vā pāpakaṃ vā tassa dāyādo bhavissāmi. The 5 remembrances are not written by Thich Nhat Hann. He is quoting the Upajjhatthana Sutta. It’s true we have no idea exactly what the Buddha said but The Dharma we know. The Sutras are thousands of years old. Anything that you say as a truth like “Fake” is a lie. It’s your opinion and your entitled to it but in this case your’e information is just your opinion and in my opinion you are wrong. Just to be clear what I am saying is you are wrong about Thich Nhat Hann writing the 5 Remembrances. Every Quote by “The Buddha” is clearly subject to query. It was kept as an oral history for 5 centuries which is what it is. Ananda passed on this history and I am good with the intentions of the Dharma and at times am irritated by things people attribute to the Buddha, but I don’t need to put up a meme saying you are “Fake” because you said Thich Nhat Hann wrote it. I see that someone has started a blog for fake Shakespeare quotes. We need blogs for Einstein, Gandhi, and the Founders of the US constitution as well. He’s not quoting, Sean. He’s paraphrasing. It’s of course completely fine to paraphrase, of course.but not to regard a paraphrase as a quote.